Visuals: There are two things that first hit you; that lovely “Island Vine” neck inlay, gorgeous and then that amazing three dimension shimmer to the Koa wood giving it a real and individual ‘personality’ of its own. Of course on the whole the guitar is very eye catching anyway, but it’s only when you get up close that you can really appreciate the quality of the beauty. Tone: Then there’s the tone. The wood is, as it looks, like a cross between mahogany and maple and so is the tone. However, the tone will mellow with playing, and play it you must to get the wood to vibrate to your tune and ‘loosen up’. Buy it, play it and really make it yours ! I know of one pretty well known local classical guitar player that ‘ages’ his guitars by playing music to them for hours on end so they ‘learn’ his music taste and tone. Sound crazy ? Is it ? Discuss ! Hawaiian koa’s captivating beauty is matched by a tone that blossoms over time, especially in the midrange. Its voice is bright and focused, with warm overtones that slowly emerge, adding sweetness and depth. Premium all-wood appointments, led by the Tropical Vine fretboard inlay, celebrate the wood’s natural appeal. 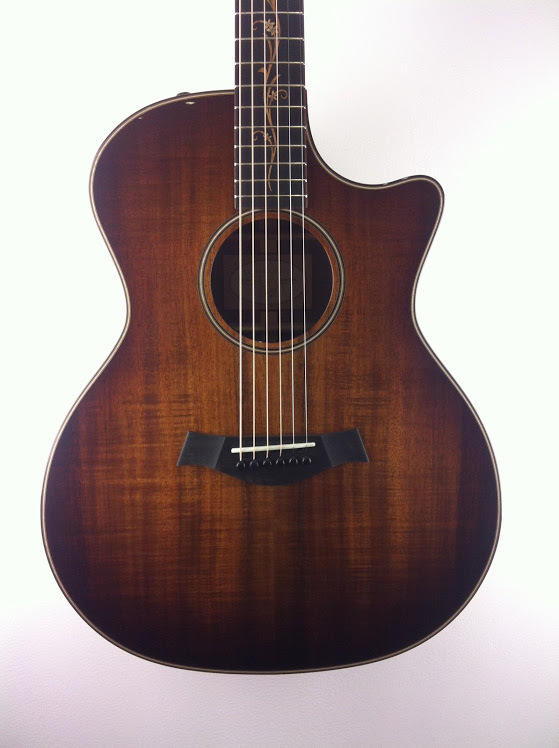 A tropical hardwood, koa’s tone blends the midrange of mahogany with the top end of maple. Due to its density, a new koa guitar tends to start out sounding a little bright and tight, somewhat like maple. But the more a koa guitar is played, the more the sound opens up, expanding the midrange and rewarding the player with a richer, sweeter, more resonant tone. A common mistake is when a bright player buys a koa guitar in part for its visual beauty, finds it to be too bright, and doesn’t play it enough to allow the wood to warm up. Goes Well With: Fingerstylists who play more with the pads of their fingers and tend to have a meatier touch. Bright players need to be careful because of koa’s existing brightness (one might try experimenting with different pick materials).